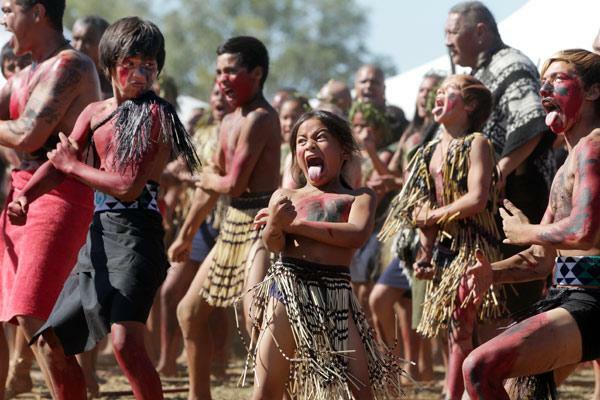 Maori children participate in 150 year commemorations of 1864 Battle of Orakau. One hundred and fifty years earlier, an estimated 300 of their ancestors – men, women and children – did the same as iwi from around the North Island stood defiantly in the face of a British onslaught. Ngati Maniapoto, Raukawa, Waikato, Ngati Tuwharetoa, Tuhoe and Tauranga became one again, but this time the theatre of war was set aside – honour and remembrance brought them here. On March 31, 1884, Rewi Maniapoto and his allies stood outnumbered by more than 1500 colonial troops in what came to be know as Rewi’s Last Stand. Realising he had the upper hand, British commander General Duncan Cameron called for Maniapoto to surrender. But he vowed to fight on – ake, ake, ake. Women warriors participating in 150 year commemorations of Battle of Orakau. The land wars carved New Zealand’s history “in blood” and Gloyne said everybody was affected by them. “There are still issues over the land in New Zealand and it’s such a huge part of us and we need to understand why. If we don’t know the information how can we do anything about it,” said Leah. 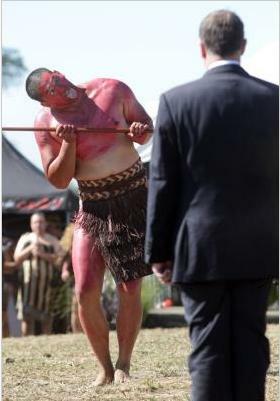 New Zealand Prime Minister John Key receives a traditional Maori challenge at Battle of Orakau commemorations. “Prime minister, this land should be bequeathed for all time and as the statesman of this country, do the right thing and return it to the proper owners,” he said. It was important to acknowledge New Zealand’s war history and while a day of remembrance was not on the cards, a return of the land was not out of the question, Key said. Waipa Mayor Jim Mylchreest said it was the last of the solemn occasions and he hoped the whole district could “draw a line and learn from our past and move forward together”. Posted on April 3, 2014, in Colonization, Videos, Warrior and tagged anti-colonial resistance, Battle of Orakau, colonization of New Zealand, Maori, Orakau, warrior. Bookmark the permalink. Leave a comment.